Anamai Singhabhandhu received her doctoral degree in chemistry in 1974 from Southern Illinois University Carbondale. Upon returning to Thailand she carried out research on the reduction of industrial pollutants for the Department of Science in the Ministry of Industry. Her accomplishments earned her an appointment as the first Chief of the Pollution Analyses and Research sub-division. She later became Director of the Analytical Chemistry Training division. Dr Singhabhandhu later held the positions of Chief of the Metrology Development program and Director of the Physics and Engineering division in the Ministry of Industry. 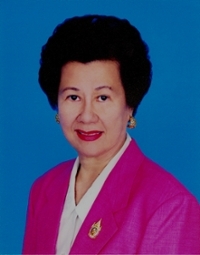 She was Deputy Director General in the Department of Science Service during discussions which led to the National Metrological Development Act, approved by the Royal Thai government, for the establishment of the National Institute of Metrology. Dr Singhabhandhu also served as Director of the Technical and Public Relations division and as General Inspector and Deputy Permanent Secretary of the Ministry of Science, Technology and Environment. Other government appointments include Ministry Spokesperson, Secretary and Chairman of the Joint Committee and of the Working Group on Public Sector Reform. She has also served as Chairman of the Association of Southeast Asian Nations Committee on Science and Technology (ASEAN-COST). Recently she was appointed to the government sub-committee for the evaluation of public sector inspection. In 2007 Dr Singhabhandhu was recognized as a Distinguished Alumni of Southern Illinois University Carbondale.